Rubbermaid totes and laundry baskets are the earmarks for a solid junk sale. I found this one via my old amigo gsalr.com on a Friday afternoon, way out in this rural area of NW Illinois. As I perused the crap I could hear rifle report way in the distance, somewhere beyond the seemingly infinite cornfields all around me. 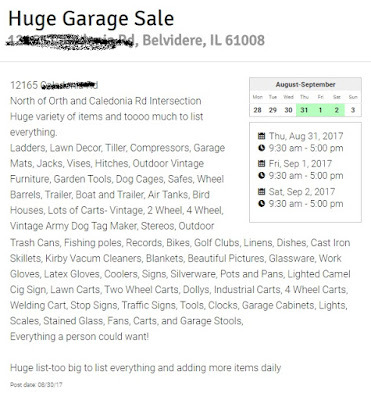 As the gsalr.com ad states above, this place was filled with crap that must have taken the guy days to haul out and roughly arrange. Luckily the records were prominently placed on a rusty old cart, with the lower shelf holding two tool boxes with 45s banging around inside, most sans paper sleeves. I found another cardboard box just behind that held more empty loot. I got the standard offer to buy them all which is ironic given I actually bought nothing. I ended up being 'lucky' enough to go back to Belvidere four times in just a few weeks and I wouldn't be surprised if I get another call soon. On one trip I brought my bike as I had so few tools to bring there was plenty of room in the truck. I hadn't planned to search for vinyl but when I was whizzing down the road I saw a SA so I slammed on the brakes and headed in. They had a nice load of vinyl but it was all stacked for maximum ring wear and minimum navigability. I bent my neck and read the spines for a while until I got bored and headed back out again. Hopefully my friend above scored something nice. I visited Bemidji once before not long ago. As I returned it was warmer out and again I had some free time. This would be a recipe for a solid hunt if I didn't feel like I had already dug pretty thoroughly. But that is always a lie! You have never dug sufficiently! Get back into the trenches you child! I ended up finding an array of spots all along the same main drag. I started in my old haunt, Books N More. Again, it seems they generate the most of their income by duplicating CDs on the numerous units behind the counter. As they whirred, I checked out their bins but wasn't impressed. Didn't look like anything had turned in there since my last visit. So I got ready to walk west on 3rd down to Economy Shop, a second hand store that looked like it might have vinyl. But before I could get there I encountered another spot just across the street which hadn't shown up on the map (as it was not listed as a thrift store). This is Secondhand Splendor! As I stepped through the small foyer I was greeted with an odd sign. Can't imagine being homeless in a place that gets quite this cold. Never before have I seen a record rack of this proportion outside of a record store. They were actually even individually priced, and outrageously so! It only added to my fun as I sorted through each and everyone. I found some real gems and others that were just, well...real. I had to look these guys up, the cover is trying so hard to be edgy and failing, I wasn't surprised to see it was a Christian oriented group that fancied themselves as 'punk'. I checked out some of their music on YouTube. 'Hard rock' would be almost a stretch but far more realistic than 'punk'. If you can't see from here, that guitar neck has a bunch of knock off Swatch watches on it (in their own defense, this was 1989). Just one quick example to illustrate just how ridiculous the prices there were. You can find this in many Goodwill stores for a buck or maybe less. Even sealed, I think you'd be hard pressed to get $10 for it. this was NEVER selling for that much, and that is the same sticker I saw on all the releases. But if you think those prices are gnarly, you still haven't checked out the 'premium section' at Secondhand Splendor! They had one small rack and then this weird screen thing that held some more vinyl. No doubt these were some classic records and some are worth a few bucks. I should have checked the prices more closely, but when I zoom in on the original hi-res shot of the screen, the only two I can make out are the Zepplin records in the lower left hand - both are $129 each! I've seen my share of defaced records before but this one might be tops. Even more wild is that it actually did contain a Buddy Holly 2xLP greatest hits. And for all this, only $7.99! My work done there, I finally trudged westward to my original destination before I was sidetracked. And just within spittin' distance was the Economy Shop! This place specialized in country music it would seem, or it just worked out that way. For a moment I was astounded that a thrift store could have so much Johnny Cash and I entertained thoughts of buying it all and immediately selling it for triple. That was until I quickly figured out that it was a carefully strategized move to take some cash off some suckers. 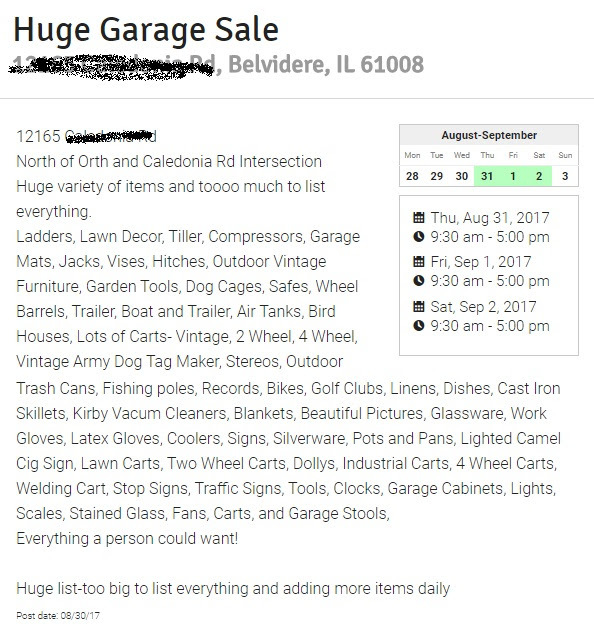 They were all individually priced and while not quite as bad as their neighbor, let's just say it wasn't thrift store prices. They probably bought these on ebay or from a record store with the sole idea of marking them up and reselling. And just a few yards from there I found a tub with some more bogus old vinyl with questionable prices. And a few yards from there, the door. And a few hours from there, back home in Chicago with another trip under my belt. I am fairly confident I have the biggest and/or best collection of barbershop vinyl on the planet. It started so long ago as it often does, in Michigan. That state is home to some of the best quartets the world has ever known. After waiting years and begging, discogs added barbershop as a style which led to some serious retrofitting of existing releases in the database. So at this point I have added 372 barbershop releases to the database. But it also allows me to search my own collection, which looks like it is at 122 at the moment. Not bad! I have a mostly complete list at barbershopwiki.com that shows where I grabbed the individual platters. This afternoon I recieved an interesting PM on discogs. 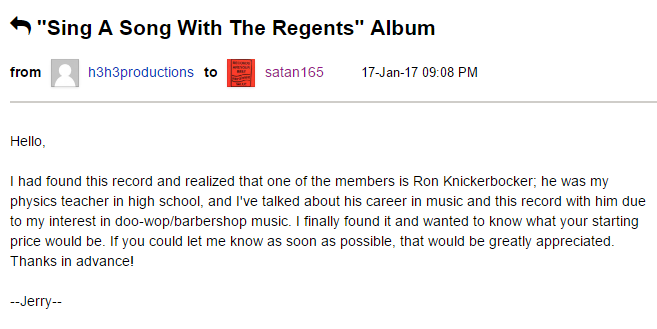 It was from a person who was aching to hear a specific (and relatively obscure) barbershop LP,. because a loved on performed on it so long ago and alas, they are no longer with us. This has happend once before. In both instances, the original request was to see if I would sell the LP. I'd probably say no regardless but in both instances they were super rare LPs that I fought long and hard to attain. But because I truly feel full of joy to share the music, I offered to rip the vinyl and put it in Google Drive so it could be downloaded. 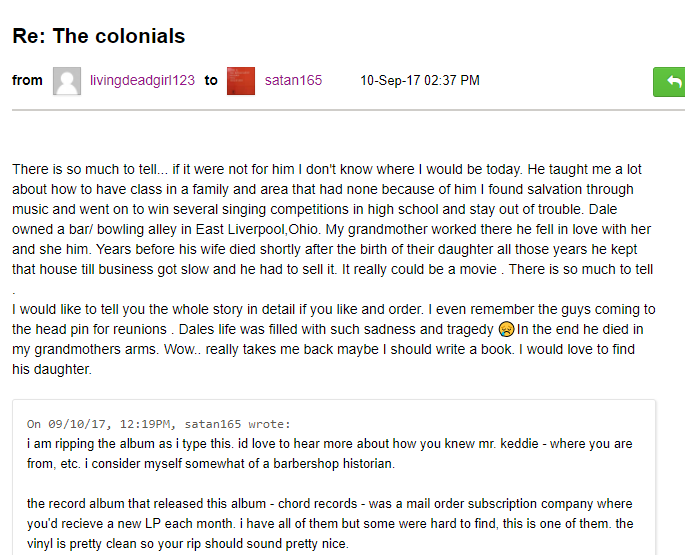 Today's requester comes from eastern Ohio and has an interest in a Chord records quartet. I have the entire Chord discography (including the 'handsome leather embossed album folder' which was available with series I) and this LP was one of the toughest to find. I doubt I've ever even put it on but I did today. Then I did a quick rip of the live songs performed on the annual competition albums. Luckily, I do own all three that they performed on, I recorded these as a quick continuous mix. As I said above, this came up once before, at the beginning of the year. I gladly ripped the album, the live competition songs and shared them at once to much delight of the person asking. I recently found out that this quartet has another LP and even more recently I got a copy. I sent the person a PM asking if they were interested but got no response. No doubt, with their mission fulfilled, they have abandoned their discogs account. I have over 700 LPs, no doubt people have many more than that, but even someone with half of what I own will be hard pressed to listen to them all. So it is an easy wish to grant, to help someone who earnestly seems to miss someone and this old album, carefully bagged and organized on my shelf is the only link. In the case of the album discussed today, it is over 50 years old! How many others are still in circulation? Very few, surely. Glad I could immortalize it for someone special. Ah yes, your typical bombed out St. V's, a spot I checked out during my brief stay in lovely Livonia. This is the 25th post tagged for St. Vincent so I guess I've been to damn near that many. But yet after all these years, not much has changed. And that is fine with me. When in doubt, just find the books or DVDs or old videotapes. If there are records, they are close at hand. I didn't find anything here as I dug around in the dirt on my hands and knees. Due to the weight of vinyl, they often find their way closer to the floor so they don't fight gravity (and an old busted up shelf) so much. This means you really have to pay for it if you want to dig, because I assure you they don't mop in a place like this very often. And they pulled the old trick on me of having additional vinyl behind me on another shelf. Just when I try to leave, they pull me back in! Nothing there either, but that's par for the course. Still a fun sidetrip on my trip towards eastern Michigan. Maybe I was due for some good fortune. I wasn't off to a good start when I saw all the vinyl stacked bookshelf style but I craned my neck and checked them out as best as I could. But in the final grouping I spied with my little eye a CTI classic (as my eye was, in turn, spied by the jacket! ), who's mate I memorably got in a record store next to a train station. I never listened to that one much but I put this one on right away, and as far as I can tell anyone would love this. The jacket is in great condition and the vinyl seems legit as well. All for the staggering price of 50 cents. Can't beat that.